The Oly Mountain Boys | Pacific Northwest Bluegrass | Blog : Steep Canyon Rangers come to Oly! Steep Canyon Rangers come to Oly! Artswalk at Rhythm & Rye was a great success - thanks Andy, and thanks Blackberry Bushes! 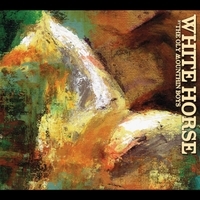 And we're still enjoying introducing more and more people to songs from our soon-to-be-released bluegrass concept album White Horse! Work continues on graphic design, t shirts will be printed this week, and White Horse should be available to all our lovely Kickstarter backers by June! We like to listen to bluegrass almost as much as we like to play bluegrass. And it's not every day that a bluegrass band of the caliber of the Steep Canyon Rangers comes through Olympia. If you don't already know the Steep Canyon Rangers from their touring or their appearances with Steve Martin, now's your chance to learn to love some great new bluegrass - Saturday May 3rd, 7:30pm at the Washington Center! We're proud to partner with the Washington Center to get the word out - and we're happy to be able to offer our fans a deal on tickets! Enter promo code "olymountainboys" when you select your tickets and get 10% off up to two tickets per order! Go see the Steep Canyon Rangers May 3rd, and come see us play around the state this summer!